(L-R): Larkin Coker, 8, of Morgantown; Brody Wilmoth, 10, of Morgantown; Ziler Hawkins, 6, of South Charleston; Jeff Hostetler; Tyler Yost, 10, of Fairmont; Adyson Stalder, 10, of Sardis, Ohio; Ivy Martin, 6, of Morgantown; and Reilly Albertson, 11, of Fairmont break ground for the new home of WVU Medicine Children’s. 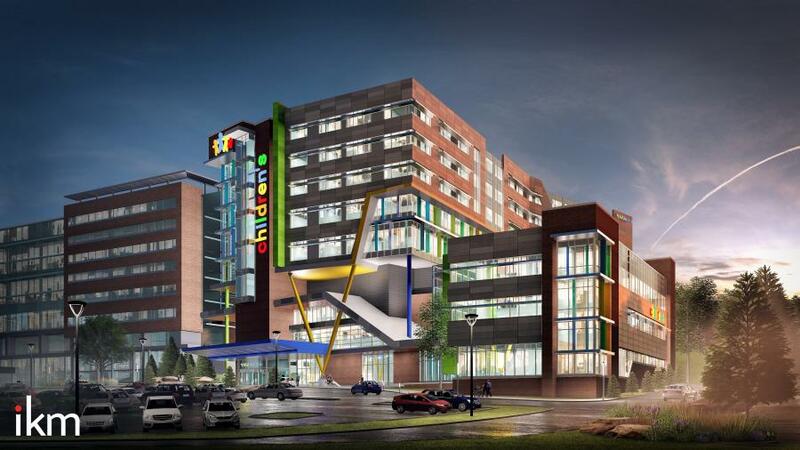 A three-year project by WVU Hospitals involves the construction of a new eight-story tower dedicated to WVU Medicine Children's at J.W. Ruby Memorial Hospital in Morgantown, W. Va. Announced in November 2017, the tower is expected to be open in 2020. It is valued at $150 million. A total of $60 million is coming from a capital campaign, and the remainder will be funded by WVU Hospitals. A Certificate of Need for the project was approved by the West Virginia Health Care Authority. The design for the 256,000 sq.-ft. structure was done by IKM Architecture Pittsburgh, Pa.
A ceremonial groundbreaking ceremony was held for the tower earlier this year. The event involved at least 100 people, including seven current and former WVU Medicine Children's patients with shovels. Also included were Albert L. Wright Jr., president and CEO, WVU Medicine-West Virginia University Health System; J. Philip Saul, executive vice president of WVU Medicine Children's; Dana Holgorsen, WVU football coach and co-chair of the WVU Medicine Children's capital campaign; and Gordon Gee, WVU president and chair of the WVU Medicine-West Virginia University Health System board of directors. "We have spectacular outcomes," Wright said. "We treat kids from all 55 counties, all around the state of West Virginia, Pennsylvania, Maryland and Ohio, and so on and so forth. Now, we're going to give a true face to the program so that when people come to Ruby Memorial for anything or for a football game, they'll see that Children's Hospital." Saul stated that the hospital is already the center for specialty care to high-risk mothers, premature infants, and children with life-threatening conditions through adolescent to adulthood. "The need for our services is growing at such a rapid pace that the creation of this hospital is a must," he said. According to Angela Knopf, manager of media relations of WVU Medicine, the 155-bed, eight-story tower will include entry, registration, administration and building services; diagnostic imaging and a laboratory; two connections to the Southeast Tower of the hospital (the WVU Heart and Vascular Institute); operating rooms, cardiac catheterization and endoscopy facilities; a 25-bed Pediatric Intensive Care Unit (PICU) and sedation unit; a 61-bed Neonatal Intensive Care Unit (NICU); a 39-bed pediatric acute care unit; a 30-bed obstetrical unit with potential for expansion; and a medical office building, including Pediatric subspecialty and Maternal-Fetal Medicine clinics. 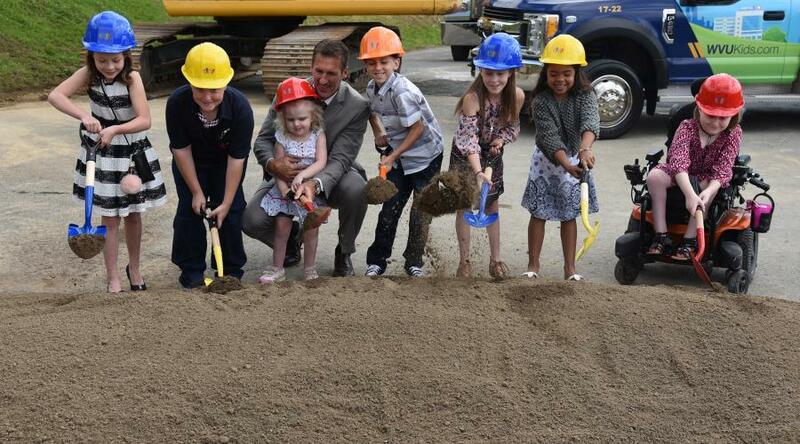 "All of the inpatient rooms will be private, except for 11 NICU rooms for twins," Knopf said. "The tower also will include inpatient and outpatient pharmacy facilities and a cafeteria." The project was reportedly originally conceived as a 10-story tower but was revised to an eight-story extension. Wright reported that it is expected to be used as a recruiting tool for top-level talent. The hospital is currently located on the sixth floor of the J.W. Ruby Memorial Hospital campus in Morgantown. Jeff Hostetler, a former WVU and NFL quarterback, serves as co-chair of the WVU Medicine Children's Capital Campaign. He had an idea to create a WVU sports-themed floor in the new tower where patients can "get away from their rooms and just be kids." He said the idea of reaching out to his fellow former WVU athletes came to him in the middle of the night. "Tens of thousands of former athletes — men and women across all sports — have come through WVU," he said. "And it occurred to me that we as former athletes could do something that's never been done before and pull together the funding for this floor." The floor will reportedly be designed to look like a WVU locker room, with jerseys, helmets and other sporting equipment. The theme will include traditional WVU gold and blue, photos of former WVU athletes, and sports-themed games like foosball and air hockey for kids to play. Transportation Officials Reviewing Gov's Proposal to Fund Road Repairs in W.Va.